Allan, a native of Glasgow, Scotland, now resides in Scottsdale, Arizona with wife Stacie and daughters, Aille and Averly. Allan combines passion for his career in real estate with an extensive knowledge of golf, in an easy going manner which makes his clients feel comfortable and confident they are in the hands of a true professional. Before pursuing a real estate career, Allan played collegiate golf at the University of Alabama where he was the recipient of the Bear Bryant Award (Top Student Athlete). Upon graduating from the University of Alabama, he pursued a professional golf career and played around the world, competing in such events as the British Open Championship. 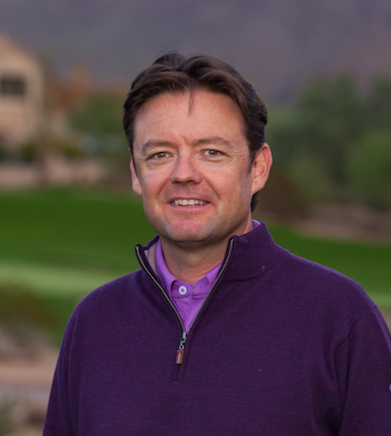 Now his golf background offers his clients a truly unique understanding and perspective on golf properties in Arizona. Allan’s passion for real estate in the golfing mecca of Scottsdale affords him the opportunity to develop new lasting relationships. His professionalism and knowledge of the luxury real estate market sets him apart from his peers. Allan relates each day in real estate to being on the first tee, “you’re only as good as your next round”…and customer service, knowledge of inventory/market conditions are imperative to success in this ever changing market. Allan is dedicated to keeping his finger on the pulse each and every day….every minute of every day. In recent years, an easy going personable demeanor with a determined work ethic has included Allan in the upper echelon of residential real estate agents in the Valley of the Sun. Allan prides himself on building trusting relationships with his clients and looks forward to helping you with all of your real estate needs. Updated: 24th April, 2019 10:30 PM.